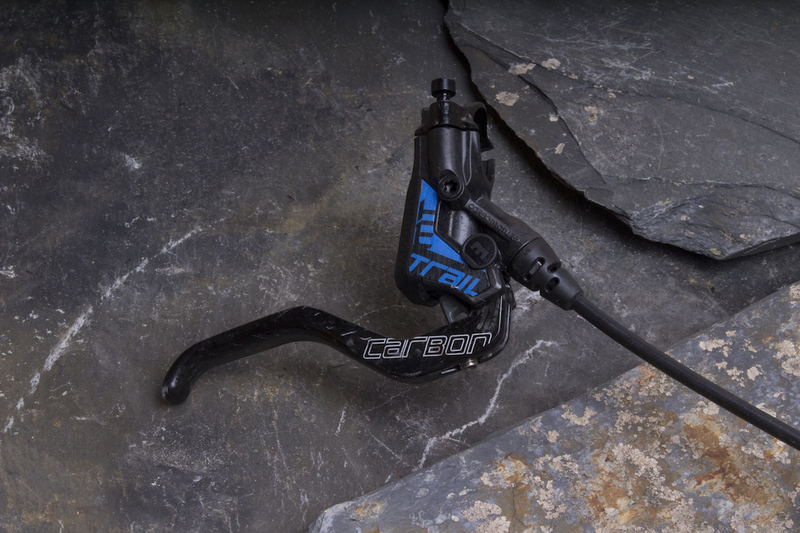 Introduced a little over a year ago, the MT Trail Carbon entered the Magura lineup as a new option for trail riders and enduro racers seeking the magical balance of power and modulation. Technically it’s not really a new brake – it’s actually the result of combining two of Magura’s existing high-end brakes – the MT7 and MT8 – into the one brakeset. 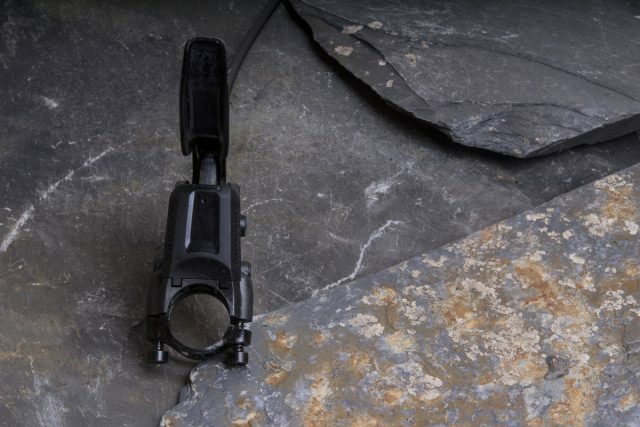 The story goes that Magura had noticed some of its employees were pairing the powerful MT7 brake on the front, with the lightweight MT8 brake on the rear. The idea being that you want more stopping force on the front wheel, and more modulation for the rear wheel. And so, the purpose-built MT Trail Carbon was born. The MT Trail Carbon brakes are equipped with lovely carbon fibre levers that can be flipped from left to right. 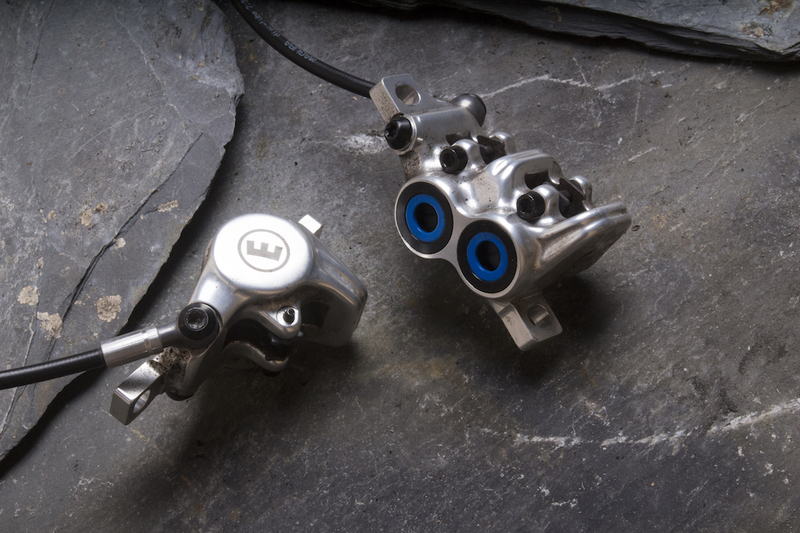 The trick polished callipers are borrowed from Magura’s MT7 brake (4-piston) and the MT8 brake (2-piston). Sitting right in-between Magura’s XC brakes (MT2, MT4, MT6 and MT8) and DH brakes (MT5 & MT7), the MT Trail Carbon is a premium brakeset built with lovely polished alloy callipers and carbon fibre lever blades. Being a Magura, it comes with a 5-year leakproof guarantee. Oh and if you’d rather hold onto that spare kidney, check out cheaper Magura MT Trail Sport that ditches the exotic materials while maintaining much of the same performance. 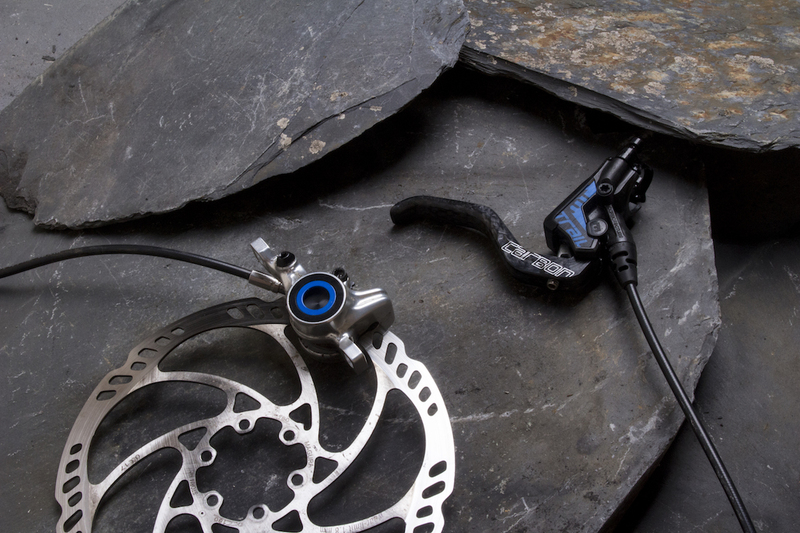 Many bike companies already spec bikes with a larger rotor on the front than the rear, and there are riders out there who mix ‘n’ match brakes with a larger calliper on the front. 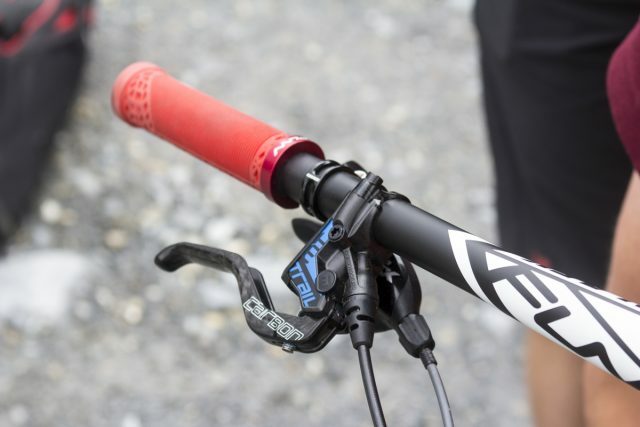 So is Magura onto something with the MT Trail Carbon? The smaller twin-piston calliper on the rear is designed to offer more modulation to reduce the chance of rear wheel lockup. The split clamp lever uses two Torx bolts to attach to the bars. There’s a tooled reach adjuster, but no pad contact adjustment. Installation of the MT Trail Carbon brakes is relatively straightforward, with a 3mm hex key adjusting lever reach, while a T25 Torx key is required to fit the levers to the bar via the lightweight split clamp. You’ll want to be careful with torque though, as the mounting bolts (which resemble wood screws) thread directly into the Carbotecture lever bodies. Carbotecture is Magura’s name for an injection-molded carbon composite, so it’s very light and purportedly very strong, but it requires careful management. Even the bleed port screw has a torque limit on it, so the mechanically obtuse will need to pay close attention. The carbon lever feels good, but it’s too long and upsets cockpit setup. My biggest beef with the Magura MT Trail Carbon brakes is the size of the carbon fibre lever. Designed to accommodate 2-finger braking, the Carbolay lever takes up a lot of cockpit space and requires you to run the lever bodies quite far inboard. I also found the lever bodies didn’t always play well with some shifter and dropper post levers, resulting in undesirable ergonomics. An option is to purchase Magura’s Shift Mix adapters (£17.70 per side) that will allow you to mount a Shimano or SRAM shifter directly to the brake lever clamp, which would help tidy things up. Also, Magura now offers a shorter 1-finger HC brake lever, but you’ll have to pay £60 extra for a pair of those. It would be fantastic to see both lever options available at the time of purchase. 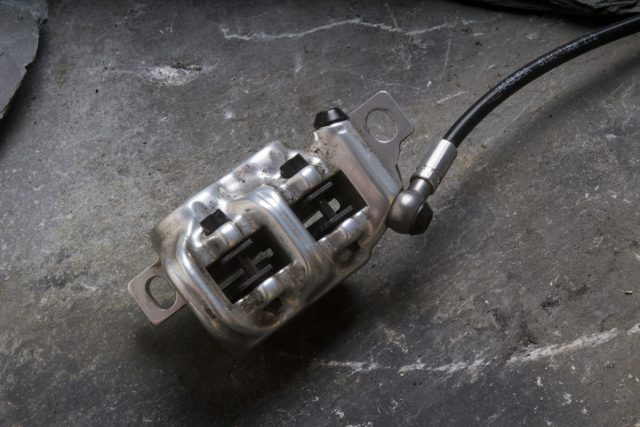 As with other quad piston brakes, the front calliper can take a little more effort to align correctly. It’s made slightly more tricky by the fact that there are four individual brake pads inside the front calliper, rather than two. This is the same as you’ll find on Magura’s uber-powerful MT5 and MT7 brakes, with the split pads employed to increase surface bite on the rotor for added power. It also means Magura can build the calliper with a reinforcing ridge through the middle of the calliper that boosts stiffness, again for more power. Compared to Shimano brakes, there isn’t as much pad rollback in either of the callipers, so careful alignment is crucial to eliminating rotor rub. Speaking of rotors, we had our test brakes setup with Magura’s thicker Storm HC disc rotors (£25.99 per end). 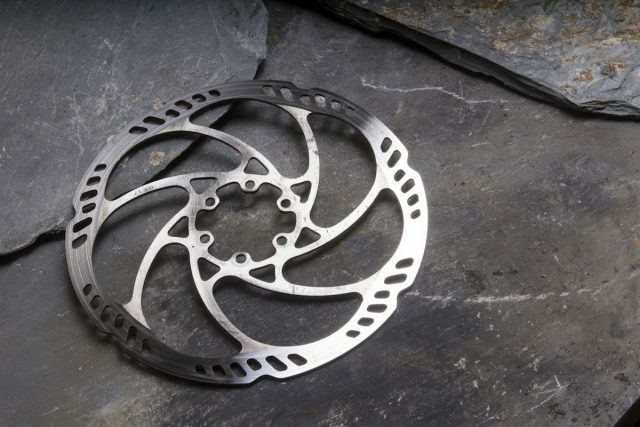 Like all the brakes in our group test, we elected for 180mm rotors front and rear. During the test period, I did trim the lines and bleed the brakes to see how easy it was to do. The answer is ‘pretty easy’. Not quite Shimano-easy, but with the correct bleed kit it’s a largely painless affair, and the use of Magura’s mineral oil-based Royal Blood fluid, it’s a less toxic experience than bleeding a brake with DOT fluid. Magura’s heavy duty Storm HC rotor provides more heat dissipation than the lighter Storm SL rotors. It didn’t take a whole lot of time before the MT Trail Carbon brakes were bedded in, and the power increased quite rapidly – particularly on the front brake. 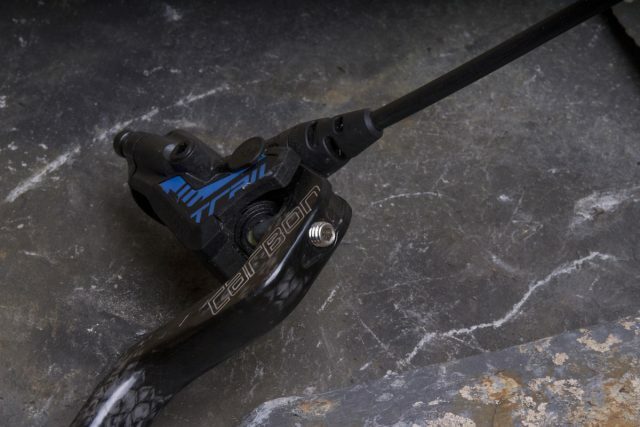 In fact, the quad-piston front brake was up there as one of the most powerful brakes on test, which is no surprise given that Magura’s MT7 is already well regarded as a monster of a brake. In comparison to the gut-wrenching power available on the front, the rear brake is much, much softer in its power. This is of course Magura’s intention, and it means there’s a whole load more modulation for your rear braking hand. Upon reflection, I don’t recall any occasion where I accidentally locked up the rear tyre, which is a good thing for a panic-braker like me. The power can be accessed if need be, but you’ll have to pull a lot harder to get there. This power differential took a good half a dozen rides to adapt to, and while I did eventually get used to it (and appreciate it too), the different braking style was noticeable when I was bouncing around between different test bikes. Power and feel are excellent on the Magura MT Trail Carbon brakes, but it takes a while to adjust to the power differential. The levers themselves feel silky-smooth to actuate, with very little fingertip force required to activate braking. And once setup to my preferences, I quite liked the feel of the hook at the end of the blade. There’s a reasonable amount of lever dead-stroke before the pads engage though, and unfortunately that isn’t adjustable like some other trail brakes on the market. The bite point isn’t super firm, with a fairly soft feel as the braking power starts its course. The effect of this is that the MT Trail Carbons deliver incredible modulation – even the front quad-piston calliper. For monitoring speed in awkward slow-speed/high-tech scenarios where the stakes are high, I was very happy having these brakes on my side, and in particular I was able to feather the rear brake more accurately to avoid skidding out the rear tyre. When pulling deeper into the lever stroke, some flex is made apparent, as was some wiggle in the lever pivots. Compared to the Trickstuff Direttissima brakes with their rock-solid machined alloy levers and quad-bearing setup, the Magura’s felt flexy in comparison. It’s not necessarily a downside, just an observation. Riding on wetter, splooshier trails, the MT Trail Carbons did squeal quite a bit, with a noticeable loss in braking power. The stock pads are an organic-based ‘Performance’ compound, which Magura claims offers high performance for all-weather braking, along with good fade resistance and medium durability. If you wanted more power though, you could fit the ‘Race’ compound pads, which is supposed to deliver more bite in dry weather, with a sacrifice to durability. The brakes come with a 5-year leakproof guarantee, and are built to an impeccably high standard. 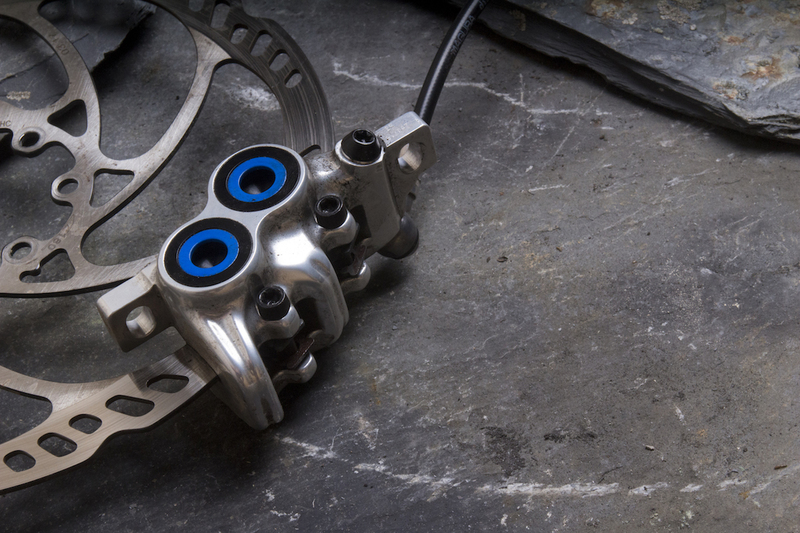 Although the concept of pairing a quad-piston front calliper with a twin-piston rear calliper isn’t new, Magura has fully committed to the concept with the new MT Trail series. 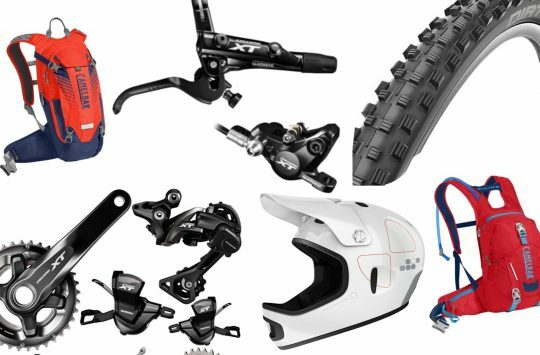 The result is a gorgeous set of brakes with great feel and excellent modulation in a package that offers the typically high level of engineering you’d expect from a German brand such as Magura. But while the finish is top-notch, the ergonomics still leave a little to be desired – mainly because of the long lever blade and the effect that plays on brake lever setup alongside your shifter and dropper post lever. We’ve since received a set of the 1-finger HC brake levers, so look out for a separate review on those in the near future. Braking power is insanely good on the front, though in our experience, it feels lacking on the rear for aggressive trail riding and valley sledding. For longer and steeper descents where slow-speed control isn’t as big of an issue, I would have liked the quad-piston calliper on the back too. 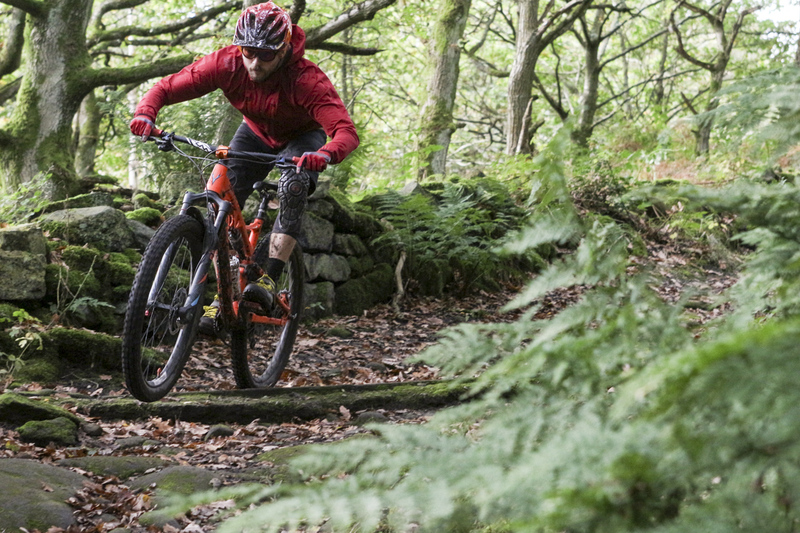 Ultimately though, the brake feel is the result of the the MT Trail Carbon’s ingredients – it is after all a downhill front brake paired to an XC rear brake. That takes some getting used to, but for the right rider and trails, the MT Trail Carbon’s unique performance certainly has its advantages. Do the front and back have identical levers, and if so doesn’t the front one move more for same pad movement (would be 20% more going by total caliper piston area)? 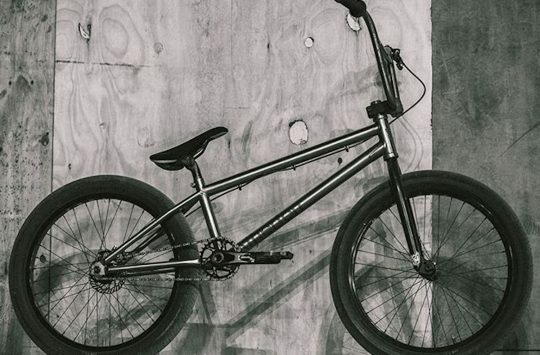 @alanclarge – the levers are identical, and ambidextrous too. So you can flip them from left to right (as I did) or run them upside down. For reference, they’re basically the same levers that come on the MT8 brakes. 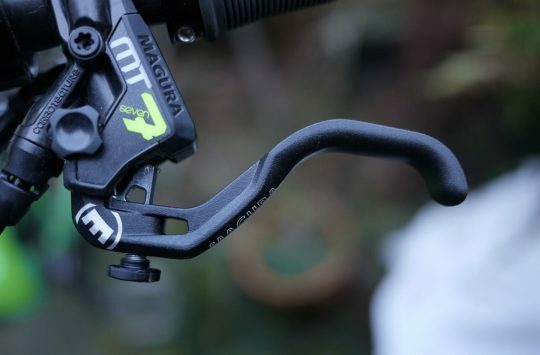 And because Magura uses similar architecture between all of its XC, trail and DH brakes, you can mix ‘n’ match levers with callipers as needed – hence why the MT Trail brake was created in the first place.